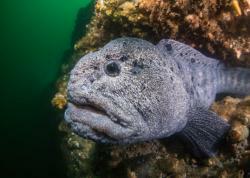 I am still surprised how often I hear that reaction from fellow divers when I tell them about the world-class diving found off the coast of North Carolina. Known as ‘The Graveyard of the Atlantic’ because of the large number of shipwrecks found within easy reach of the coast, the waters off of North Carolina also harbor a multitude of big marine life including southern stingrays, barracuda, sea turtles, and even the occasional whale. But the stars of the show are the sand tiger sharks. 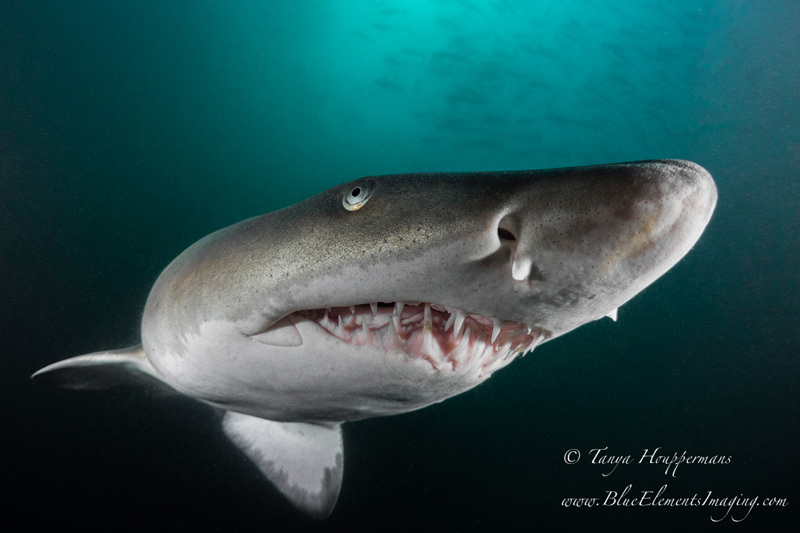 The sand tiger (Carcharias taurus), also known as the ragged tooth or grey nurse shark, resides in temperate waters worldwide. Although ferocious-looking with rows of pointed, protruding teeth, sand tigers are quite docile. Adult sand tigers average 6-10.5 feet in length and can weight up to 350 pounds. 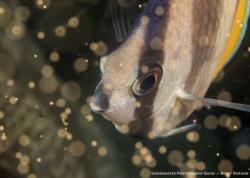 Their diet consists of bony fish, skates, rays, and even smaller sharks. Sand tigers are found year-round in the waters of North Carolina, although their numbers tend to be higher in the May-October timeframe. No bait is used to draw the sand tigers to the area; the sharks are already there. They congregate around the many shipwrecks, although no one is quite sure why. 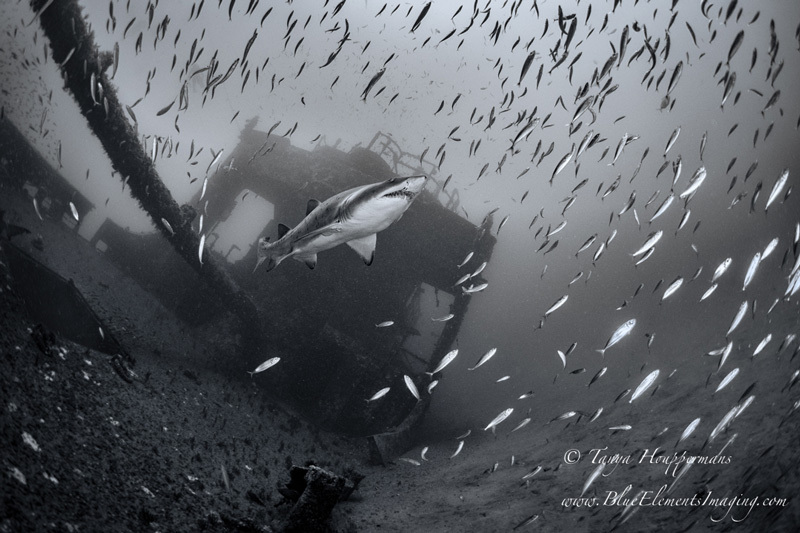 One theory is that there is more food around the wrecks due to the abundance of fish on these artificial reefs. 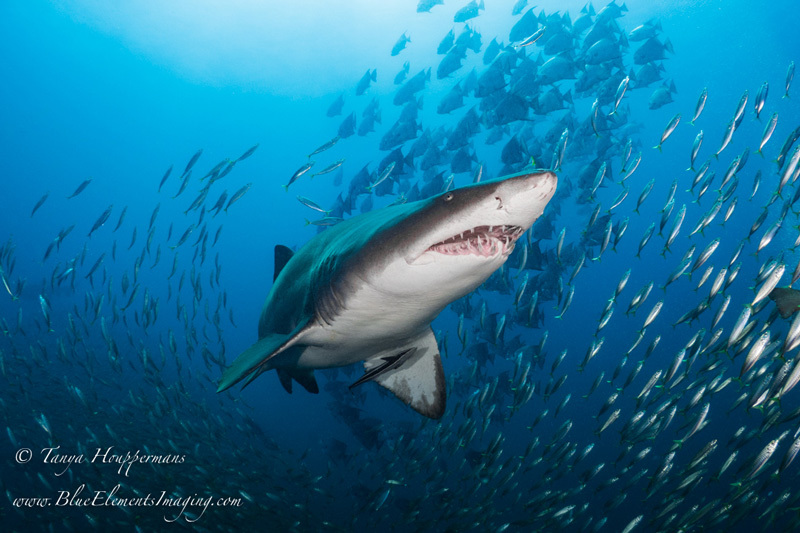 Another theory is that water temperature may be slightly warmer in and around the wrecks, producing a more comfortable environment for the sharks. Whatever the reason, North Carolina is one of very few places in the world where divers are able to experience the thrill of both a wreck dive and shark dive simultaneously. 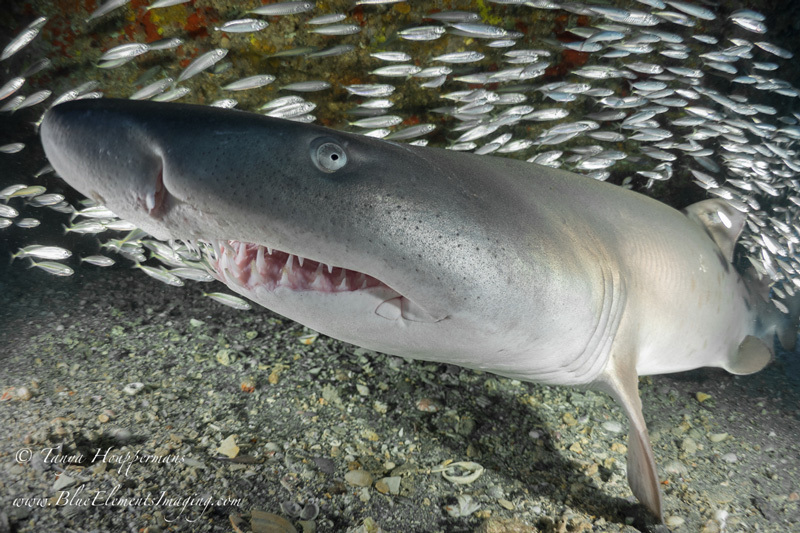 The sand tigers are very tolerant of divers if approached from the front or side (where the shark can see the diver). If approached from behind, the sand tiger may become spooked, in which case it will warn the diver with a sudden “thump” of its tail, producing a startlingly loud noise sure to get the diver’s attention. As with any wild animal, approaching slowly and cautiously will yield the best results. 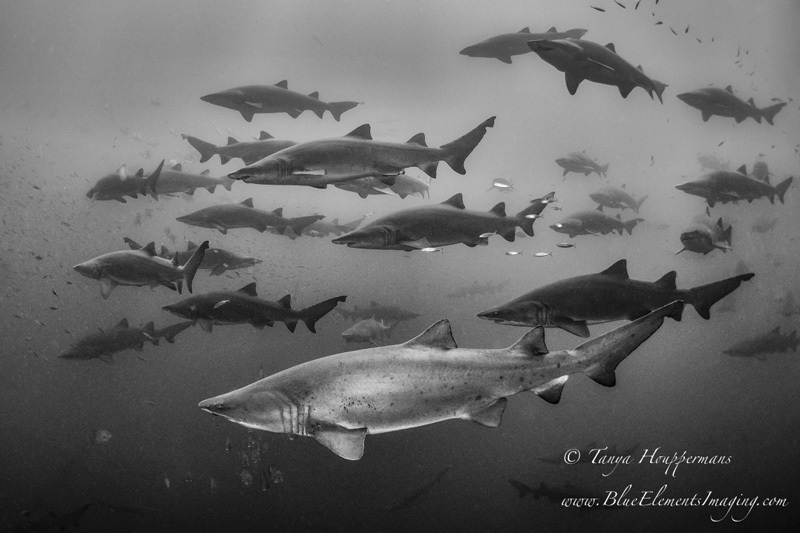 In the July-Aug timeframe every year off of North Carolina, sand tigers congregate by the hundreds, particularly near the wreck of the Caribsea. They tend to stay in mid-water, at the 40-60ft range, where they meander lazily, providing an amazing spectacle for divers lucky enough to witness it. I highly recommend using manual mode since lighting and visibility may vary significantly during a single dive due to shifting currents, depth, and your location in relation to a shipwreck (whether you’re above, in, or to the side of a wreck). Having the ability to quickly adjust your aperture, shutter speed, strobe power, and ISO is important. My preference is shooting at higher shutter speeds, typically 1/250-1/350. 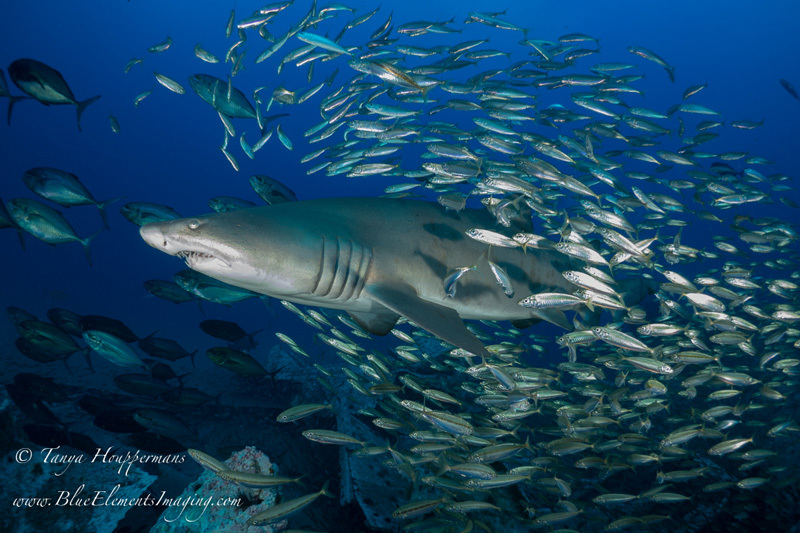 Oftentimes schools of baitfish will surround sand tigers, and using a fast shutter to freeze motion often results in a sharp image of baitfish nicely framing the shark. When photographing the large groups of sand tigers, I’ve found that using a fast shutter speed with a wider aperture (f/3.5-f/5) produces sharp images of the closer sharks while still correctly exposing the sharks father away in the group. 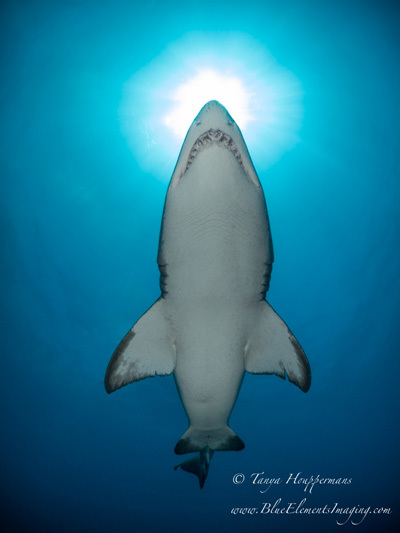 Shooting upward from beneath a swimming sand tiger can make for a lovely image of the shark against the lighter-colored blue water of the surface; however, the underside of the shark is nearly white, making this area easy to overexpose. Keeping strobes at 1/3-1/2 power while using a medium aperture (around f/10) tends to yield the best results in this situation. North Carolina diving can be somewhat challenging, and it is not for the inexperienced. The boat rides are typically 1.5-2.5 hours, and dives can be as deep as 125 feet. The seas are sometimes smooth and calm, but can be choppy and rough. The good news is that during the summer months, water temperature is typically around 80°F, and visibility can reach 80-100 feet or more. Coastal North Carolina offers a marine environment like few other places in the world. 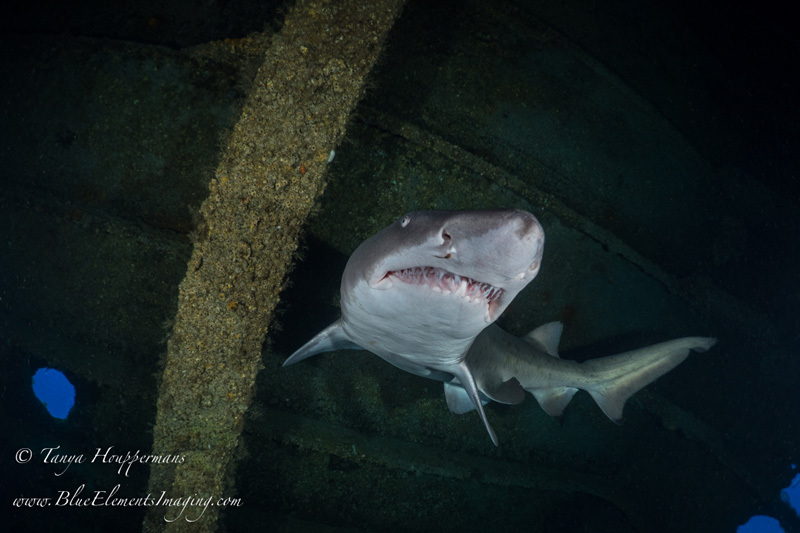 Where else can you dive on a World War II German submarine (the U-352) and swim with dozens of sand tiger sharks in the same day? For the wide-angle underwater photographer, North Carolina truly is a dream destination. 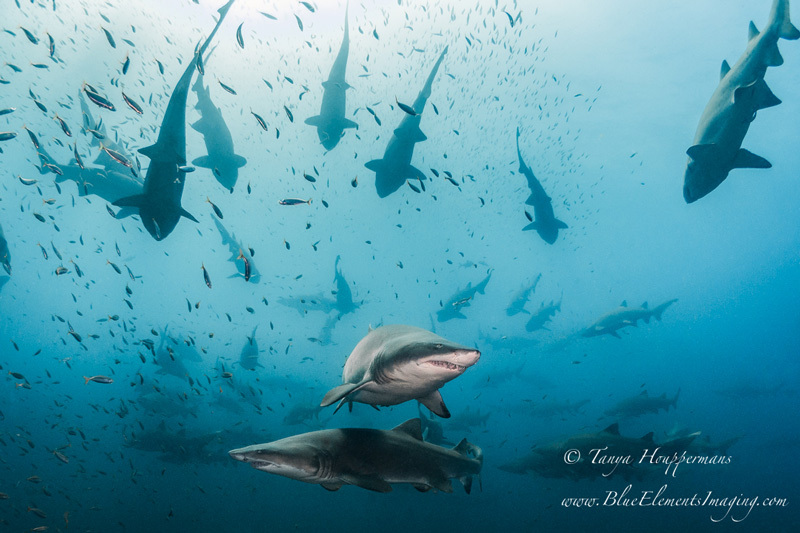 Tanya Houppermans is a professional underwater photographer, marine conservationist, and writer. 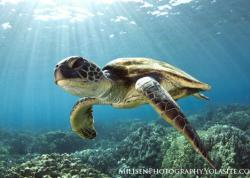 She especially enjoys photographing sharks, and is involved in several shark conservation efforts. She is also an advocate for adaptive scuba programs for those with disabilities, as her own son is a certified scuba diver who has autism. For more information about Tanya and her work, please visit her website at www.BlueElementsImaging.com, and follow her on Facebook at facebook.com/blueelementsimaging.